They meet in the Octagon Suite annex of the Kings Hall Conference Centre. 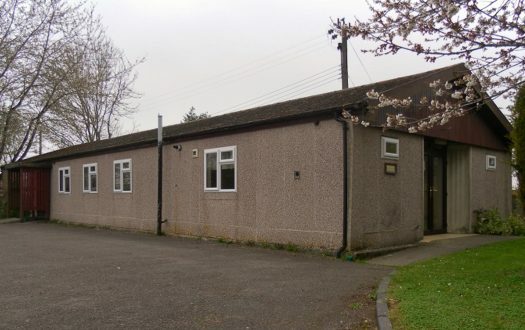 It is basically, as the name suggests, an eight-sided room. Large and roomy inside, it has a low-ish ceiling with a plethora of sunken spotlights and faux chandeliers. The decor is neutral: the walls and ceiling are painted white and the floor is partly red carpet and partly laminated wood. The stage is bare except for a six foot tall wooden cross, which is loosely draped with a purple scarf. There is also a very simple lectern placed slightly off-centre, presumably to allow a clear view of the drop-down projector screen. 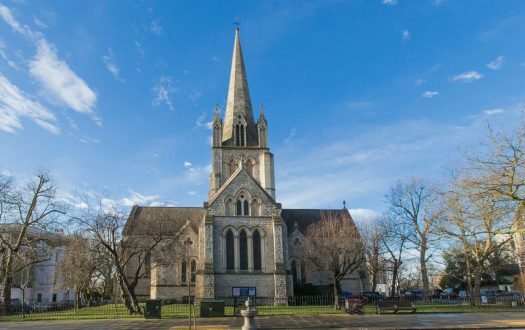 Christchurch was founded in 1998, I believe as a break-away from another Belfast Brethren assembly called the Crescent, and originally met in the downtown branch of the YMCA. 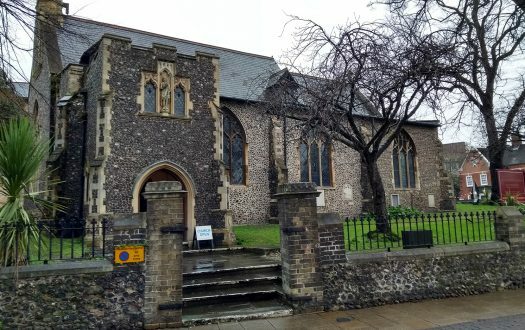 The most notable thing about Christchurch is that this is the church where Derick Bingham served as pastor for around ten years. Until his sad death from cancer earlier this year, Bingham was one of Northern Ireland's most beloved figures. 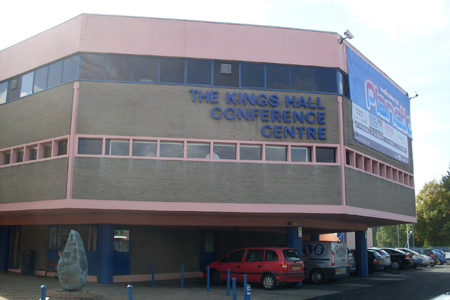 The Kings Hall is a large venue which, until the recent construction of the Odyssey Centre, attracted all the major musical and other entertainment events in Belfast. Nowadays it is still the venue for trade shows and country fairs. It is situated on the Lisburn Road about three miles from the city centre, in a very busy and densely populated cosmopolitan area. There are many trendy and upmarket shops, bars and cafes. It is also a stone's throw from the exceedingly affluent Malone area and very close to the dividing line for West Belfast, which has a markedly different character. The service today was led by a man named Carson. The music was directed by Keith Mclure. Jackie Whyte gave the sermon. The service doesn't seem to be named, but I know there is only one service each Sunday. As I entered, I was impressed at the huge number of seats that had been set out and that were still empty, probably around 300. By the time the service got underway, though, almost every slot was occupied. At the outside entrance I was handed a service sheet and asked if it was my first time. Once I was inside, someone smiled and said, "Good of you to come!" After I had sat down, a gentleman sat beside me and asked me if I came regularly. When I said I was new, he proceeded most helpfully to explain the names of those taking part in the service. It was a bog-standard metal frame and cushion that caused no undue discomfort or distraction from the proceedings. There was an excited babble with lots of laughing and a steady stream of people arriving right up to the start. Piano, two guitars and a drum kit. The piano never really came through, however, as the others were very loud. There seemed to be an enormous amount of coughing and spluttering that came in waves. It reached a thunderous crescendo immediately before the sermon. A very sickly congregation, I thought to myself, which caused me a major worry later on (see below). Keith, the young music leader, began the worship with a funny story and then read Psalm 27 ("The Lord is my light and my salvation  whom shall I fear?"). The music was very well played and the songs were all contemporary choruses. At the end there was a fairly funky rendition of "Crown him with many crowns". By funky I mean unconventionally modern and stylish. The congregation sang along fairly well, but I sensed some resistance among the pews and they seemed to be battling inertia through some of the items. 6 – Jackie Whyte managed a few moments of earnest, but overall I felt he appeared too urbane and unruffled. I for one was definitely not grabbed by the collar (metaphorically speaking) and shaken up and down by his calm, knowing style. I think, in the end, there were too many points. I was left with no single memorable thought to take home with me. So a bit disappointing. His text was 1 Peter 1:3-9 (through Christ's resurrection we have new hope). Today was part two of a series titled "Resident Aliens." By following Jesus faithfully we will impact the world. Resident aliens (1) get a fresh start; (2) are well kept; (3) get it tough; and (4) love Jesus. That the collection was taken using deep velvet bags came as a relief to me. When they pass a shallow plate, I am always nervous that someone will notice me dropping the token. And today I felt particularly well surrounded by prying eyes. Communion, for two reasons. First, and especially, because of all the coughing. I shuddered in horror to see the wine being passed around in plain glass beakers and noticed that the deacon only wiped the rim at the end of each row, not between individual sips! However, I was lucky (or so I thought – but see below) because I was at the start of a new row! Second, because communion was another incredibly noisy slice of the service. The deacons all advanced at once and trundled through the place like a herd of elephants. The floorboards were squeaking wildly and another round of coughing began. Anyone expecting some moments of quiet contemplation would have been thoroughly frustrated. I stood at the back, where there was lots of milling around. There were at least two people who made eye contact and sized me up. I could sense the wheels turning in their minds while they decided whether to speak or not. But they both left me hanging. Yes, it did feel quite awkward. The tea had been in the dispenser too long. It was fairly gross and I didn't finish it. I didn't bother with the dry-looking biscuits, as they weren't remotely appealing. 5 – From the announcements and the general buzz, I get the impression that there is a real sense of community here. But, for me, the service itself was just too bland. Nothing to get overly excited about. Yes, I appreciated that this bunch of people are clearly quite sincere about their faith. I found that encouraging. Well, since I woke up the next morning coughing and sneezing, I am not likely to forget them in a hurry. Perhaps I will send them the bill for the vitamin C!